Since the start of the craft gin boom, the tonic market has evolved rapidly. To serve the very best G&T, it’s not only about the gin, but also how you serve it, and in particular what kind of tonic you use. The choice of tonic waters (whether plain, slim or flavoured) is endless, not to mention the range of tonic syrups! By the time you have selected the right garnish for each serve then pondered the optimum glassware (do you favour balloon glasses or are you a highball kinda guy/gal…) you will definitely be needing that drink. The truth is that many of these decisions will make only a marginal change to the enjoyment of your drink, but the one that has a big impact is the choice of tonic. It is, after all, often more than half the entire drink. 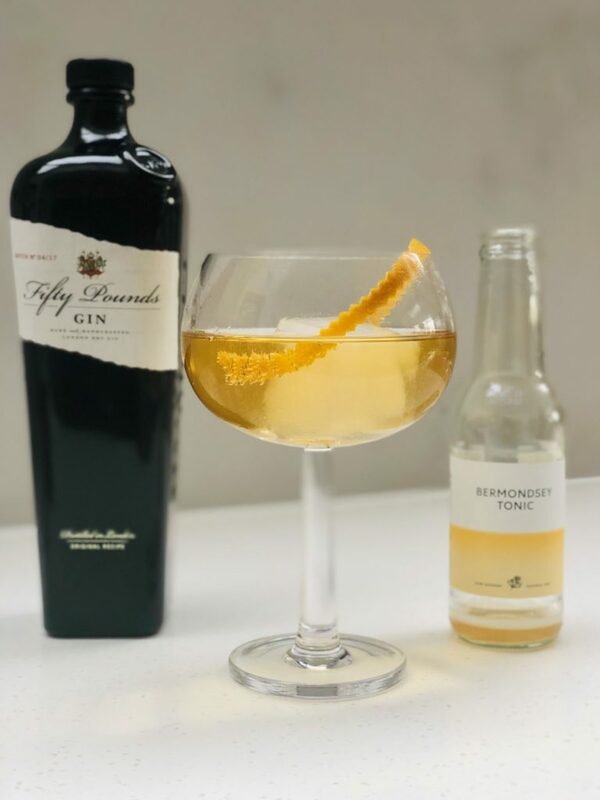 To make matters slightly less overwhelming, we have listed some of our favourite tonics to go with Fifty Pounds Gin. Tonic water is a quinine-based bitter drink. Quinine comes from the bark of the cinchona tree, which grows in South America. Back in the day, quinine was used to fight off malaria and other diseases. It was served with sugary water, but British colonials didn’t quite like the taste and started to add gin to it, creating a Gin and Tonic. Before the Ginaissance really started, the choice of tonic waters was minimal and the quality was not great due to the various artificial ingredients and sweeteners used. These artificial flavourings can create a slight metallic taste, which can also ruin the taste of good-quality gin when served together. You want your tonic to have enough bubbles, long-lasting fizziness and natural flavour, good enough for you to drink it on its own. Some like it more citrusy, others dry and crisp. Fever-Tree was the first all-natural tonic brand to take advantage of the growing popularity of gin. Today they are hugely successful, with several flavoured tonics also available. Many would say Fever-Tree is their number-one choice, their go-to tonic. However, in recent years, several other brands have emerged, and with consumers becoming more open to sampling various combinations, there is room for many brands to shine. Double Dutch Pomegranate & Basil – Basil is part of the anise family and has similar flavours to liquorice, making it a nice match with the botanicals in Fifty Pounds Gin. Pomegranate adds a subtle sweetness. This tonic will bring out the herbaceous aromas. 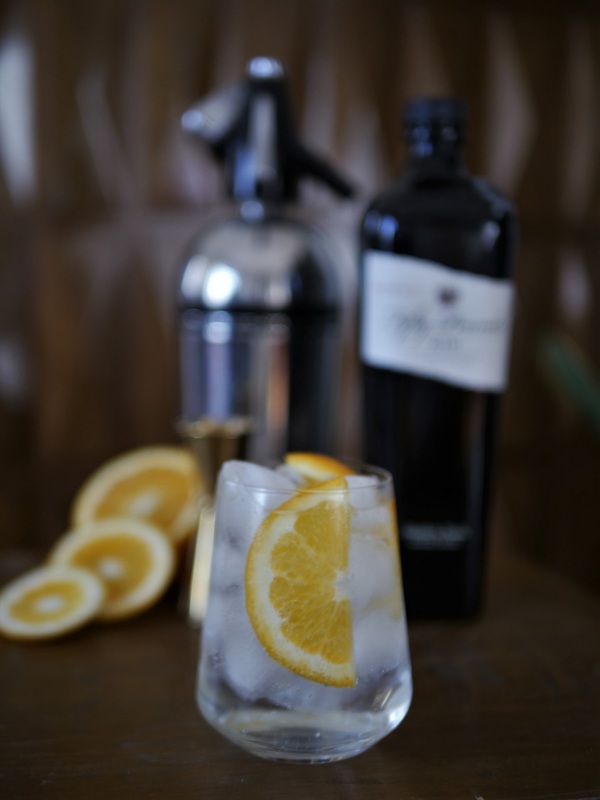 Double Dutch Indian Tonic Water – The top note of quinine is balanced with pink grapefruit. This is a perfect tonic for classic gins and therefore matches well with Fifty Pounds Gin garnished with a slice of orange. 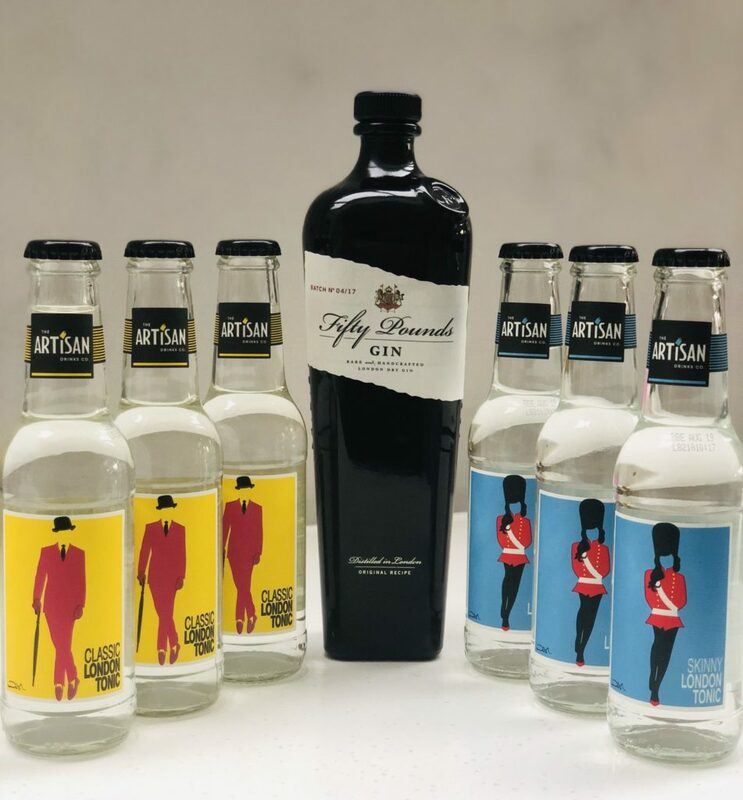 Artisan Skinny London Tonic – If you’re looking for a lighter tonic, this one pairs well with Fifty Pounds Gin due to its complex citrus notes. Garnish with a juicy slice of orange. Keeping it simple with tonic and a slice of orange. Franklin & Sons Natural (Light) Tonic Water – Makes an excellent G&T with our recommended serve. Fentimans Valencian Orange Tonic Water – Beautiful aromatic tonic water made with quinine, oranges and lemongrass. It pairs well with Fifty Pounds Gin – garnish with a sprig of thyme and orange zest. If you’re looking for a less aromatic G&T, try Fentimans Connoisseurs Tonic Water. London Essence Tonic Water range – This mixer range is wonderful and all their tonic waters complement Fifty Pounds Gin. Choose from Classic Tonic Water, Grapefruit & Rosemary (try an olive garnish), Bitter Orange & Elderflower (juniper berries or basil & lime) and Pomelo & Pink Pepper. 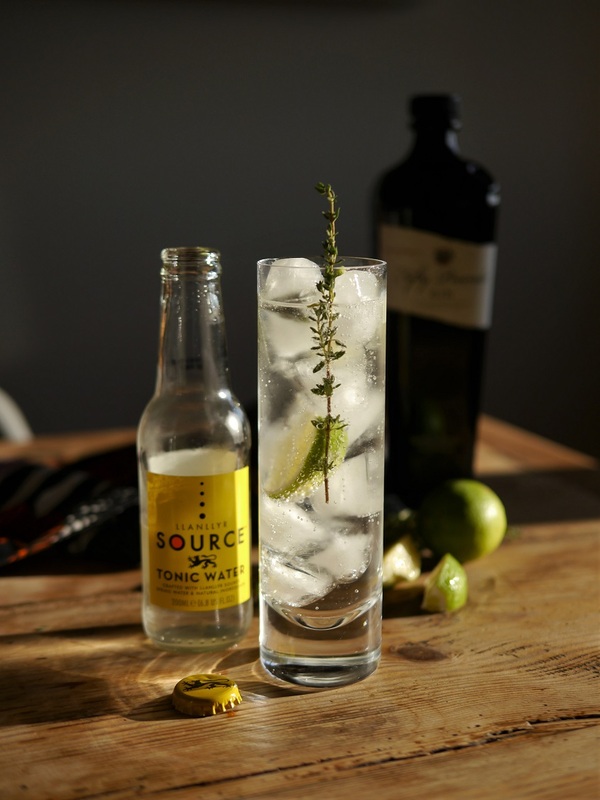 Llanllyr Source Tonic Water – For traditional G&T serve, try Llanllyr Source Tonic Water. Its citrus notes work nicely with this classic juniper-strong gin, just garnish with a sprig of thyme and a lime wedge. Tonic syrups are made with natural ingredients and are often amber in colour. Instead of quinine extract, they are made from the bark straight from the cinchona tree, which gives the syrup its colour. You know how some people say they don’t like gin, but it’s actually the taste of the tonic water that they don’t like? Tonic syrups allow you to dilute the quinine flavour to a preferred level of bitterness. You simply combine the syrup with sparkling or soda water, usually 1 part of syrup to 4 parts of soda, but this varies with each brand and your taste. With syrup, you don’t have to worry about tonic going flat, and one bottle of syrup will last some time if stored properly in the fridge. Tonic syrups can also be used with Prosecco or in various cocktails, with or without the addition of soda. Great for experimenting. Jeffrey’s tonic is recommended to be mixed at a 1:5 ratio with soda. There are two Jeffrey’s syrups that stand out when looking for a mixer for Fifty Pounds Gin. The Original Recipe with an orange peel as a garnish, and the Lime, Galangal & Orange is great with a lime twist. ¾ OZ Tonic Maison is your classic tonic with a bitter flavour. Serve with Fifty Pounds Gin, sparkling water and an orange slice. ¾ OZ is recommended at a 1:4 ratio. Bermondsey Tonic Water (BTW) comes highly recommended. This concentrated tonic syrup has a well-balanced bitter-sweet flavour. With BTW the ideal ratio is 1:5 with carbonated water but also comes as a ready mixed tonic which gets its beautiful amber hue from the natural cinchona bark used to make it rather than quinine extract. Bermondsey Tonic has a beautiful amber hue. Jack Rudy Tonic Syrup is made with quinine distillate together with a subtle selection of botanicals and cane sugar for sweetness. For G&T, a 1:6 ratio with soda is enough, or make a Hot Gin with a 1:4 ratio with hot water and 50ml of Fifty Pounds Gin. This list really is endless – there’s an excellent selection of Indian tonic waters and flavoured tonics out there, and many pair well with classic gins like Fifty Pounds. To really understand the differences in flavour, compare tonics on their own. This will help you to find the best choices for your palate. We love exploring the botanical combinations of new gins, so why not give the same attention to mixers, especially when they do contribute a lot to the drink itself. When ¾ of your drink is the mixer, surely you want it to be the best quality?